Being well aware of the challenges involved in achieving accurate and specific myelin imaging, I was delighted to have the opportunity to talk to Drs Yajun Ma and Jiang Du about their recent paper on ultra-short echo time (UTE) imaging, a technique able to directly encode the signal from protons with ultra-short T2 values, such as those from myelin macromolecules, but also many others such as cortical bone and tendons. Dr Du is no newcomer to our blog, having talked to Highlights last year about his work with UTE sequence development, and we are now keen to hear about the group’s recent advances in this area. MRMH: Could you start by telling us a bit about yourself and your team? 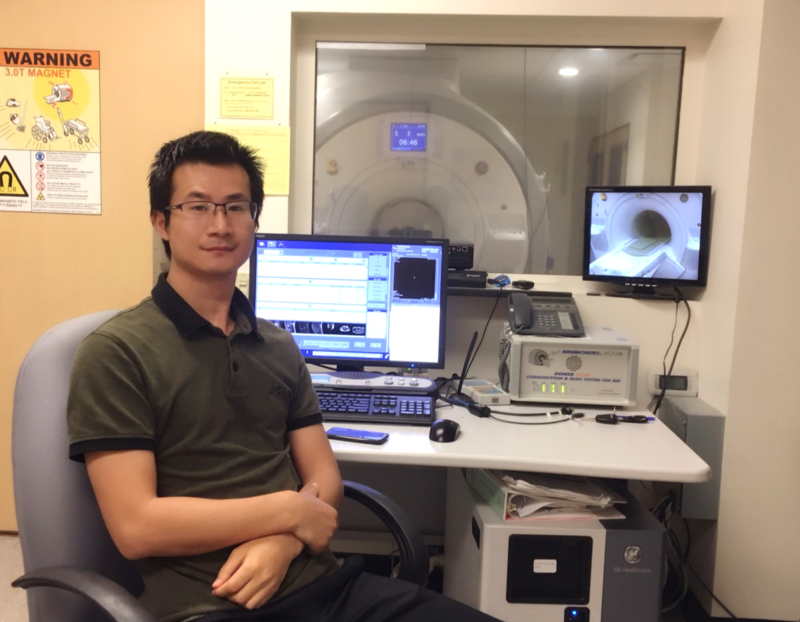 Yajun: After getting my PhD from Beijing University, I joined Dr Du’s lab as a post-doc in October 2015. I’m now working on UTE biomarkers for bone and musculoskeletal tissues. Most of my research has been focused on quantitative UTE imaging of cortical bone using double adiabatic inversion recovery UTE (DIR-UTE), accurate T1 measurement for total water and pore water using the UTE actual flip angle-variable TR (UTE-AFI-VTR) technique, collagen proton imaging using UTE magnetization transfer (UTE-MT), and bone mineral imaging using UTE quantitative susceptibility mapping (UTE-QSM). I have also been working on new techniques for morphological and quantitative imaging of myelin in the brain and spinal cord. 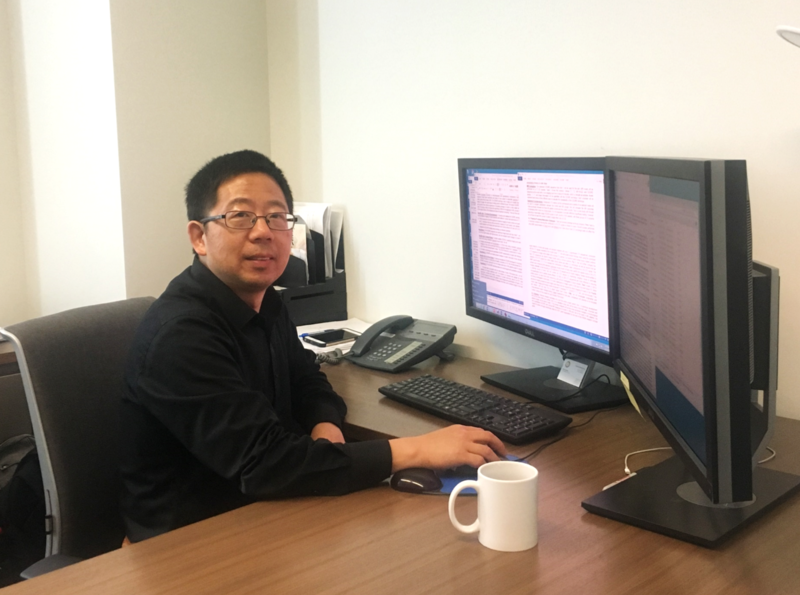 Jiang: I joined UCSD in 2005 as an assistant professor in Prof. Graeme Bydder’s team to work on the UTE program. In collaboration with GE, UCSD has been developing UTE biomarkers for close to 15 years. We have six post-docs in the lab, as well as five visiting scholars, three technicians, and two research coordinators. 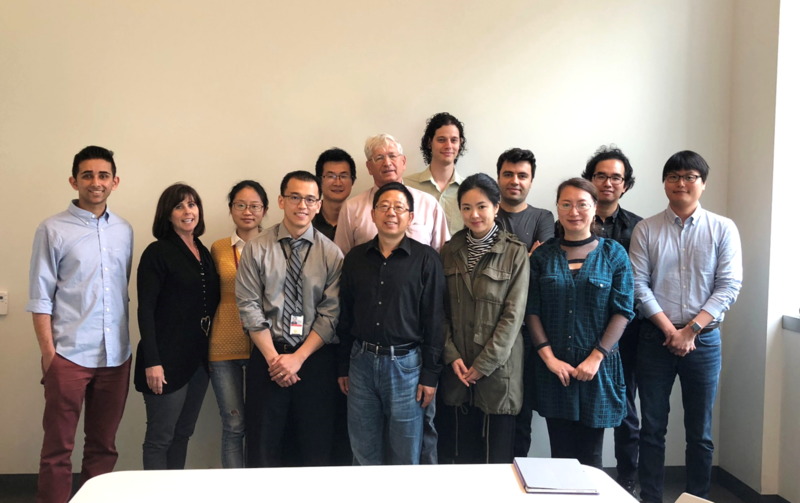 The research we do covers sequence development, modeling of contrast mechanisms, and UTE imaging applications for various tissues and conditions. We study the correlation of various UTE biomarkers (T1, T2, T1ρ, MT, and susceptibility mapping) with changes in cartilage, tendons, ligaments, and so on. We also aim to measure myelin directly, and are trying to work out whether the signal really does come from myelin protons. In addition, we study bone biomechanics and are trying, for instance, to correlate various UTE-measured water compartment volumes with bone porosity. As for clinical applications, we want to establish whether re-myelination can be detected using UTE acquisitions. We are currently running an in vivo longitudinal study involving 30 patients with multiple sclerosis. We are also testing re-myelinating drugs using UTE imaging. This work, in collaboration with Novartis, is conducted in rats and mice using 7T and 11.7T Bruker scanners. So, there’s lots of stuff going on here! MRMH: Could you tell us briefly about the history of UTE imaging? Jiang: UTE imaging started with John Pauly’s famous SMRM abstract in 1989. The main problems in those early days were the technique’s sensitivity to eddy currents and its poor contrast, so the images weren’t that great. As a result, clinical applications were practically non-existent. Then, in 2003, Prof. Graeme Bydder and colleagues proposed many new contrast mechanisms, especially adiabatic inversion recovery UTE (IR-UTE) where the long T2 components were suppressed leading to significantly better contrast. Later, Philips incorporated the 3D radial UTE technique into their scanners, while Siemens developed PETRA in their systems. We have been working with GE developing 3D Cones for fast morphological and especially quantitative UTE imaging. All the major MR vendors have developed zero echo time (ZTE) imaging, mainly for morphological purposes. Quantitative ZTE imaging remains to be developed. MRMH: What do you measure with UTE imaging? Jiang: By using T1 or MT contrast mechanisms, for instance, we can see short T2 components much better, and this allows us to derive specific UTE biomarkers. For example, we can quantify all the components of bone: water, collagen protons (using UTE-MT modeling) and minerals (using susceptibility mapping). This is a significant advance over the current standard approaches such as DXA or CT which can only assess the mineral component. MRMH: On to the paper at hand. Could you tell us about the 3D DIR-UTE-Cones sequence? Yajun: A typical adiabatic full passage (AFP) pulse is several milliseconds in duration and can only invert the longitudinal magnetizations of long T2 tissues (such as fat and muscle), but not those of short T2 tissues or tissue components (such as bound water in cortical bone or myelin protons in white matter of the brain). The short T2 components, although saturated, quickly recover because of their short T1 values, and a strong contrast can be obtained when data are acquired around the signal nulling point of the long T2 tissues. The double adiabatic inversion recovery (DIR) preparation allows us to suppress signals from long T2 components with a large range of T1 values. For example, we can get excellent suppression of signals from both fat (T1 ~ 350 ms) and muscle (T1 ~ 1400 ms). The acquisition of multiple spokes per DIR preparation is also employed to significantly improve the sequence time efficiency. Our signal model can be used to get the best TI1 and TI2, to minimize the long T2 signals, and to quantify the short T2 tissues or tissue components, such as bound water in cortical bone. Jiang: 3D radial encoding is very time consuming. Cones encoding is much faster. The downside, however, is more blurring, which can affect quantification accuracy. We still seem to be able to do fairly accurate measurements in meniscus, ligaments or tendons, where T2 components aren’t that short. Bone tissue, however, has a shorter T2 which makes it more challenging; but even with bone, the error in quantification is in the order of ~3% when compared with radial UTE imaging. MRMH: What challenges do you face in UTE image acquisition? Yajun: With such short echo times, the eddy currents are particularly strong. This problem is overcome by using short rectangular pulses for excitation, as can be done in 3D imaging. Another challenge is the management of the ADC delay and the gradient trajectories, which are particularly off for regions far from the isocenter. We have to take these problems into account. Jiang: It’s true, partial volume, eddy currents, and scan times were all major problems with 2D-UTE, but 3D UTE imaging has overcome them to an extent. Keeping scan times manageable continues to be a particular challenge especially in 3D IR-UTE imaging: because of the long inversion times, we have to acquire multiple spokes per preparation, and this is particularly complex. Using cones encoding to improve acquisition efficiency provides a partial solution. But we have to propose even more advanced encoding and reconstruction schemes to solve these issues.